First and foremost at Hammerworks we handcraft Gooseneck Lighting for superb quality that is second to none! More importantly we offer a choice of solid copper or brass. 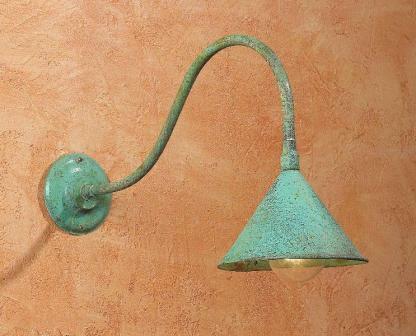 Or maybe you prefer a verdigris finish? Furthermore several models feature a black powder coated steel arm for a striking contrast. Not only that we make both fluted round or cone style shades. Another factor to consider, with a variety of sizes and arm configurations Gooseneck Lighting is easily customized to your unique specifications. 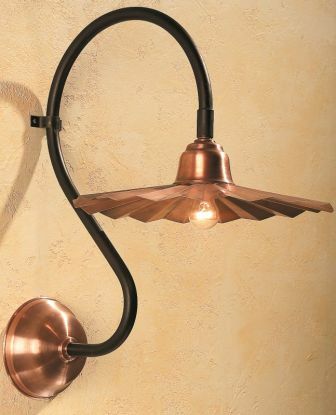 Most notably most Gooseneck Lighting fixtures are rated for up to 150 watts in a standard medium base socket. Above all our Gooseneck Sign Lighting is made completely by hand in the USA. While the most common intent is to light storefront signs, Gooseneck or Sign Lighting is also a popular choice for residential use. Consequently they are a great alternative to illuminate a variety of outdoor home spaces. Thus for singular overall effect consider using Gooseneck Doorway Lighting to illuminate your home entryway, garage, or deck. Furthermore not just for exterior use, add a dramatic interior effect with Gooseneck Lights. First of all Pendant Fluted Shade Light with its’ straight arm makes ideal task lighting. Therefore as an alternative to our handcrafted Antique Tin Pierced Pendant Light Shade group them together over kitchen counters & islands. Or perhaps add a touch of rustic simplicity over a pool table! Not only that they’ll create a dramatic statement over a bathroom vanity. In addition restaurants often use them over salad bars or booths. Thus Gooseneck Sign Lighting provides a unique option for any residential or commercial lighting design scheme. 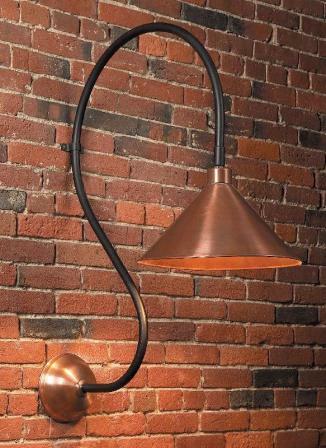 Finally, it is evident solid copper or brass Gooseneck Lighting offers a variety of uncommon solutions to your lighting needs. In addition to outdoor sign illumination, Gooseneck Sign Lighting applications range from outdoor home, barn and garage doorways to kitchen, bathroom or pool table lights. 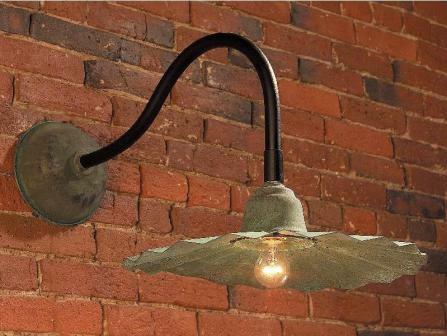 Of course at Hammerworks you will always find outdoor Colonial Wall Lanterns. As always we handcraft each rustic style wall lantern with meticulous historical precision. 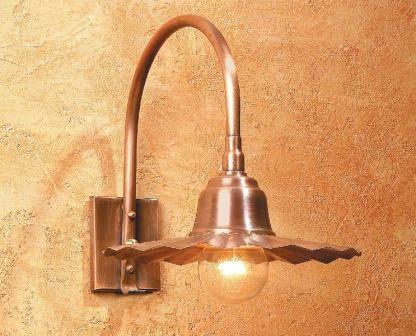 Furthermore we make each Early American Home Wall Light in your choice of solid copper or brass with a variety of finish options. 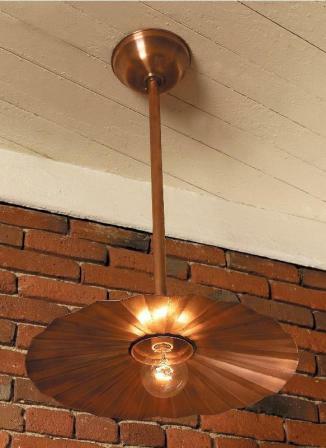 Most of all you will love the attractive satin patina of the the hand rubbed antique copper and brass finish. As a result it will oxidize naturally over time. 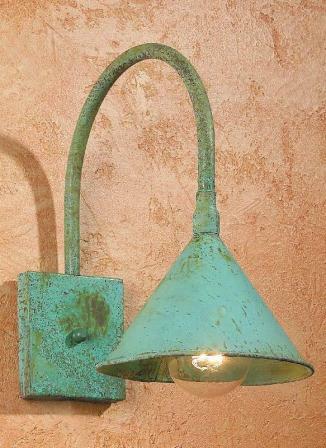 If you prefer, we can apply a Verdigris finish for a rustic weathered look. In addition if you’d rather have a polished effect we offer a painted black finish. 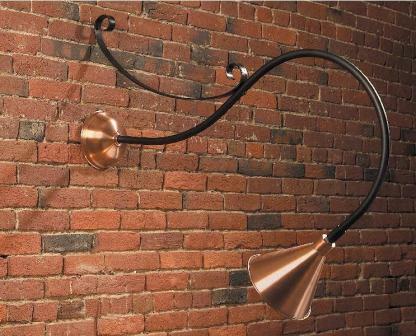 Regardless we create a wide range of Copper Wall Lanterns. Furthermore they coordinate beautifully with Gooseneck Lighting as well as Colonial Post Lanterns or Colonial Hanging Lights. 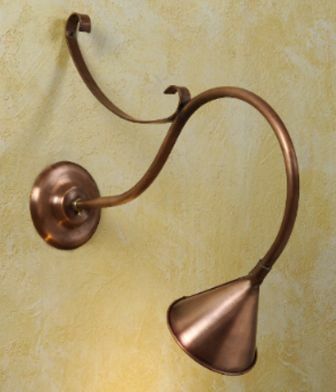 Therefore if your design scheme calls for a Colonial Home Copper Wall Light, consider the “Williams” Collection. 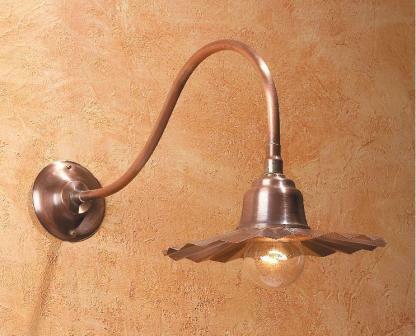 In addition Colonial Reproduction Home Lights W102 or W106 are also excellent choices for an Antique Reproduction Home. Finally if you prefer a classic style, take a look at Traditional Wall Lanterns WML102. 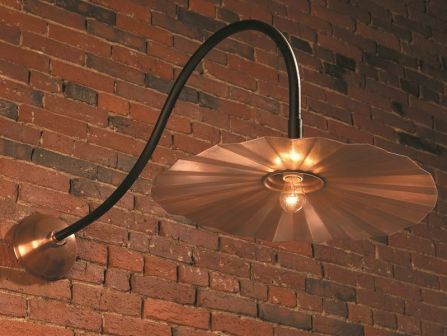 This historic design lighting offers a time-honored look sure to please. With simple yet refined and graceful lines, they are an ideal complement to a variety of home designs. In conclusion no matter the architectural style of your Period Home you will find the right Colonial Wall Lanterns at Hammerworks. From a traditional Colonial to an antique New England Farmhouse, our Colonial Outdoor Wall Lanterns are an excellent choice. Of course you can choose from a full array of Outdoor Colonial Post Lanterns to coordinate with Gooseneck Lights. Most importantly we use the same high quality materials to custom make outdoor post fixtures. Therefore with a choice of verdigris, painted black, antique brass and antique copper you can create a uniform appearance throughout any landscape design theme. Most noteworthy, by nature Colonial Post Lanterns will last for years to come. Most notably our selection of Colonial Lighting extends far beyond your homes’ exterior. Therefore we handcraft a wide assortment of Early American period reproduction Chandeliers & Wall Sconces. Hence you have a choice of custom designed hand turned wood center chandeliers as well as carefully crafted antique tin or brass chandeliers and wall sconces. As a result you can easily decorate your entire home, both inside and out with superior handcrafted lighting from Hammerworks.